Frontier Kids offers a place where children from infants through kindergarten can experience a hands on discovery of God’s world in DISCOVERY U. Our Frontier kids staff must adequately qualify to serve in this ministry. Each staff member has completed a thorough application, background check and training program. Frontier’s Kids Church is offered during all of our weekend services. ALL children (babies through 5th grade) attend Frontier Kids each Sunday! Babies—for infants from 6 weeks old to age one or until your child is walking. Walkers—for children walking up to 23 months old. Our nursery is staffed with caring adults who provide a safe and secure environment conducive to the child’s physical, social and spiritual growth. When you are confident in leaving your baby in the care of our staff, then you are able to worship with a sense of security. We have taken great care to prepare our nursery rooms to be the best environment for your baby with age appropriate toys and an opportunity to interact with others. As we hold the babies, we pray for them to receive all that God has for them in life. We believe every child we pray for will be touched by God. Frontier Church considers the nursery to be an important area of ministry, both for the parent and the child. Our preschool is for: 2 years old, 3 years old, 4 years old and Kindergarten. During services, your child will be in the care of several trained volunteers all of whom meet required background standards. 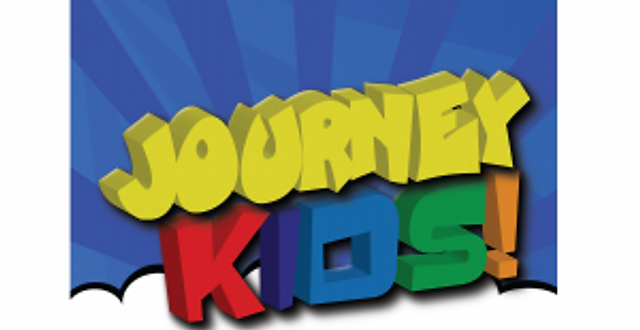 Our first through fifth graders can discover and develop a passion for God in JOURNEY KIDS. Through worship, teaching, and a variety of fun activities, children are exposed to God’s Word and challenged to grow in their relationship with God.